I have added a new section to the top level page on My DNA. The new section is entitled Search for the Ancestors of Philip Newell and is added to the section on my Ancestry DNA results. This section analyses my distant DNA links (5th + cousin) to people with the Newell, Noel, Knowles and Neville names in their trees. I have added new information on Grace Newell, daughter of John and Patience, under the Early Newells section. I recently added a new section o the Andrews family of Port-de-Grave, my father’s mother was Clara Andrews of PDG. Started a new section, under ‘The Early Newells’ Tab on the Wells family of Salmon Cove. My great grandmother Caroline Wells was from this family but they also had sveral other connections to the Newells of ‘The Dock’. For the past several months I have been conducting new research into my DNA (updating research from 5 years ago). This body of research has grown to the extent that I have given it a new top level Tab on the Web Site. This section is still under development. I have restructured the Web Site to better reflect the information I currently have. I moved information on Newells from other areas of Newfoundland to it’s own section on the opening page. I have also added a section on Merchant Connections under ‘The Dock’. 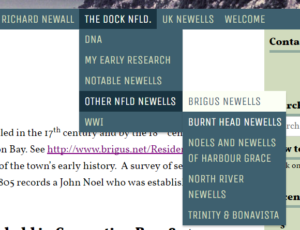 I have started adding material on the Newells of Brigus and Burnt Head (towns near ‘The Dock’). This is posted under “Other Nfld. Newells” which is under “The Dock Nfld” (see location in menu below). Both of these sections are still under construction so I will be adding more material in the future. I have just added a new section on the Newells of North River. This is saved under a new Tab “Other Nfld Newells” (see menu below). I have also added photos of Jane Reed and photos and other information on Lewis Newell under the WWI Tab.